This is the house we are renting starting August 1. I’ve lived in Ames, Iowa, for four months now. By myself. Next week, my wife and younger daughter finally will join me amid the vast fields of corn and beans. I’ve been living in a townhouse not far from Iowa State University. 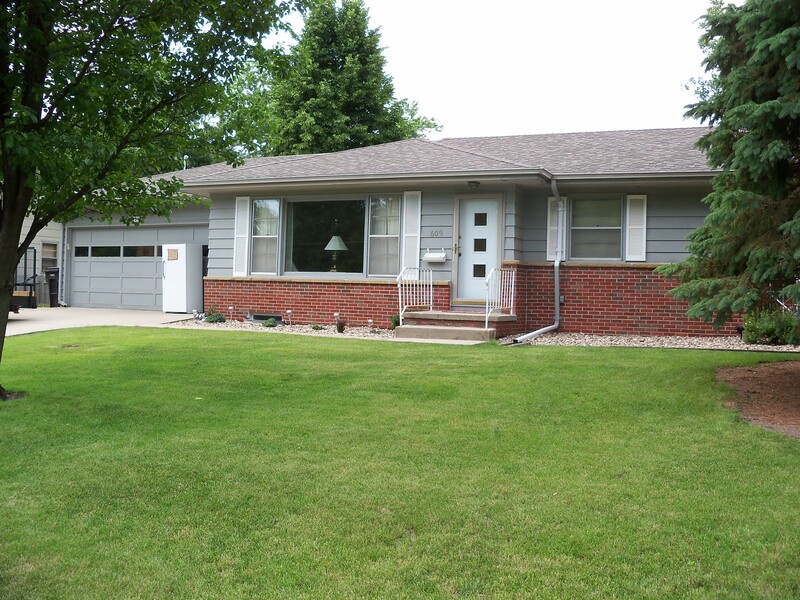 On August 1st, we will move into a house in an established neighborhood close to the center of the city — half a mile from the high school, a mile and a half from my workplace, the Ames Tribune, in the historic downtown district. Over the past four months, I’ve learned a lot about Iowa. I’ve driven around quite a bit, visiting various towns and cities. I’ve read the papers voraciously, picking up all sorts of information and history. I’ve gathered a modest collection of books about Iowa and done a little reading in them. What’s most interesting, to me, so far, is how unsung Iowa is. There’s a lot of interesting stuff that has happened here and that is going on today, but you don’t hear much about it beyond the state’s borders. Iowa seems to be easy to overlook, to pass by with an eye on getting someplace perceived to be more interesting. This appeals to me, actually, because it’s something I might be able to take advantage of. As a journalist and historian, one looks for stories that have not been told, histories that have not been fully explored. If I were to move to Chicago, say, it would be difficult, I think, to uncover some great story there that no one else noticed. Iowa, by contrast, seems to contain a lot of stories that could be told for the first time. Iowa probably is neglected in part because it doesn’t do much to promote itself. In general, Iowans are modest and don’t seem to feel it’s appropriate to boast, so they go about their lives without a lot of fanfare. This is exactly the opposite of Las Vegas, of course. Everything about Las Vegas says, “Look at me! Aren’t I great?” That can get tiring, especially when reality doesn’t live up to the hype. 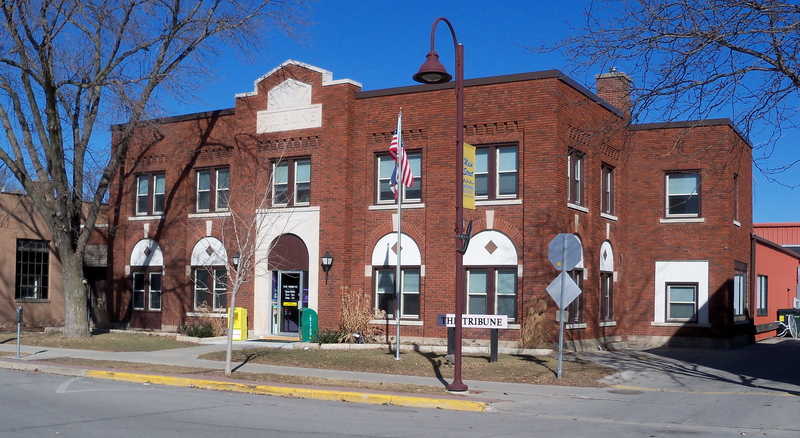 The Ames Tribune building. This picture was taken a few months ago, in the early spring before the grass turned green. But Iowa actually has a lot to boast about, if it were to do so. The economy is strong, resilient. It’s not just the corn, either. It’s manufacturing and wind energy and medical and banking and technology. The schools are very good. In addition to the three fine public universities, the state is full of small, private colleges, some of them very desirable. I’m most familiar with Iowa State, which focuses on the sciences, especially agriculture and engineering. But there’s also the University of Iowa in Iowa City, which has the medical and law schools, as well as the Iowa Writers’ Workshop. Des Moines, which is 30 miles from Ames, is emerging as one of the more interesting and desirable midsized cities in America. It’s constantly being ranked highly in surveys of the best places to do business or to be a young entrepreneur. At the national level, few people give Des Moines a second thought. They’re thinking about Portland, Oregon, or Austin, Texas, or the Twin Cities, or whatever. But they would be smart to consider Des Moines. It’s on the move. To be fair, parts of Iowa are in decline. I’m speaking of the small towns that no longer have a good reason to exist. Over the past couple of decades, they’ve been losing their schools, post offices and retail establishments. A good number of them — not all — are dying. It’s sad, but in this age of interstate highways, it’s no big deal to drive 30 or 60 miles to get the things one needs or enjoy a night out. Regional commercial and cultural centers — big towns, small cities — have emerged to take the place of each small town providing all the amenities to serve a small group of people. Driving through some of these towns can be depressing. Lots of empty, rusting buildings suggesting glory days long past. 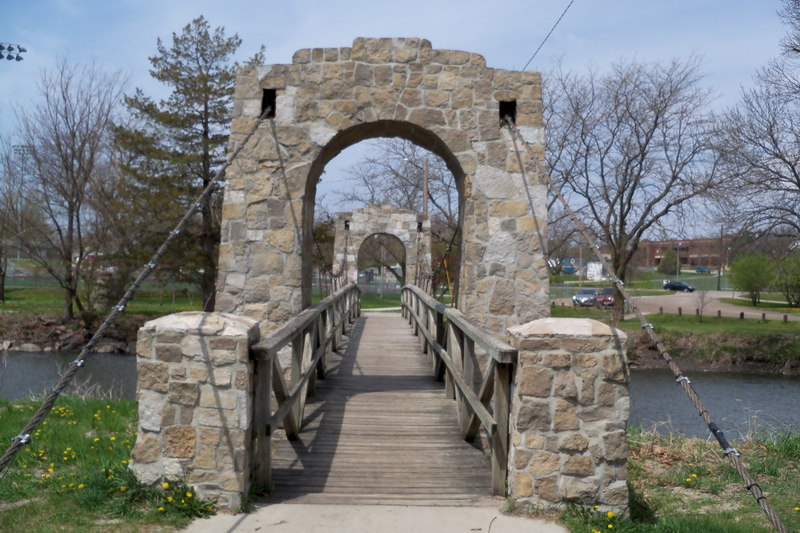 An old bridge crossing a river in Story City, a small town 10 miles north of Ames. It’s been incredibly hot and humid the past few days. Iowa is part of an extreme heat wave that has struck the country’s entire midsection. If you combine the temperature with the humidity, it feels a lot hotter than the actual temperature suggests. The “heat index” here is well over 105. Supposedly the heat index is going to hit 115 tomorrow. All I can say is it’s a stifling heat. If you walk out of an air-conditioned building into the moist air, your glasses fog up, as if you’re in a steam room. It’s not pleasant but it’s no worse than an actual 110-degree day in the desert. By law, Iowa kids can start detasseling at age 14. (In Illinois, they can be as young as 12.) It’s a hot, exhausting job, so lots of kids drop out after just a few days. An iPod is recommended. My wife and I are curious about how farming works. We just don’t know much about it. It’s not that we want to become farmers, but we want to have a certain modest level of understanding of the state’s primary industry. We’re thinking it would be interesting to take a Farming 101-type class, or maybe just spend a little time on a nearby farm and get a basic explanation of what goes on there. I fly back to Las Vegas on Friday, marking the end of my bachelor-esque period in Iowa. Then we drive back to Iowa next week and start our adventure here in earnest. I feel good about it, even with winter not too far down the road. Jeff, I don’t know what I’d do without your blog. I’ve been away from my home state for an awfully long time, visiting only for a few days to visit relatives and to promote my Stephens Press book, The Home for the Friendless. The setting is in Iowa where I was born and raised until we moved away when I was fifteen. When I lived there I didn’t give a hoot about what other towns were like because we rarely traveled away from Cedar Rapids. When my mother used to run away with us she never went very far. Now that you’re looking at my home state with new eyes and a mature outlook, I appreciate Iowa. In each of your blogs I learn more new things that make me want to return and become a tourist. Thank you for seeing it in a way that I’ve never experienced. Your enthusiasm has rubbed off on me. If ever I return as a tourist, I need to hire you as my guide. Just name your price. OR, you could create a new Elderhostel workshop. I would attend and bring a family member along. I’m serious. I’m indeed happy that your family will soon be joining you. Geoff – this was a good read to a former Midwestern. I grew up in farm country, though not on a farm. I spent summers detassling corn, a thankless and hot, boring job, to baling hay and picking beans with migrant workers. It gives you an appreciation of where food comes from. Next spring, plant a small garden. You will gain an appreciation for what real food tastes like, which is nothing like Costco or Albertson’s. Hey Geoff, so glad you’re sharing your Midwest adventures with your friends. Bill and I were just making a list last night of the states we haven’t visited, and Iowa was on the top of the list. One of these days, we’ll pop in for a visit! It is fun to learn along with you of life in a different (and perhaps less frenetic) place. Enjoy! C.
Kind of reminds me of the House Howard and Jean had on North Palm in Hollywood. ผมอยาก ฉันจำเป็นต้อง ขอขอบคุณสำหรับการ นี้ ยอดเยี่ยม อ่าน ! Good post. I learn somethjing new and challenging on blogs I stumbleupon everyday. It’s always interesting to reawd content from other writers and practice a little something from other websites. I really like tthe knowledge youu presen here and can’t wait to take a look when I get home. my own blog soon. Anyways, should you have any suggestions or tips for new blog owners please share.